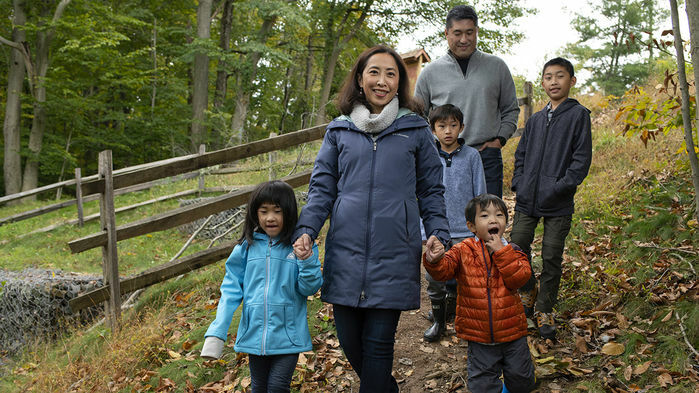 Subject Su Wang, her Husband Dan Chen, and their children Isaac, Nathaniel, Juniper, and Luke walking on a trail near their home in New Jersey. In woodchucks, as in people, the virus is a shape-shifter. It can lie low, tucking itself away in liver cells and giving few signs of its presence. It can establish a chronic infection, churning out new viruses but doing little harm. Or it can rage, triggering liver damage that can develop into HBV-related cirrhosis or cancer, which kills nearly 900,000 people around the world each year. Whipple’s woodchucks, which his lab infects with the virus to study its life cycle and assess experimental medicines, are also afflicted. On this October morning, a veterinarian is doing an ultrasound on the belly of an animal with a tumor-ridden liver. “That’s gnarly,” Whipple says as the bulky mass appears on the screen. HBV can be controlled with drugs and prevented with a vaccine, but the drugs have to be taken for a lifetime and vaccine coverage is spotty, even in many wealthy countries. Now, there’s a drive underway to find drugs that can permanently cure the infection, suppressing the virus thoroughly enough to free patients from the burden and expense of daily pills. In all, nearly 50 potential treatments are under development, which either directly attack different steps of the viral life cycle or boost host immunity. It has been a boon for Whipple’s business. “There’s been a flurry of activity with lots of companies,” he says. This year alone, Whipple’s lab, Northeastern Wildlife in Harrison, Idaho, has evaluated seven novel treatments. The push for a cure reflects both need and opportunity. Nearly 300 million people worldwide have chronic infections, although only 10% have been diagnosed, and fewer still receive treatment. Meanwhile, recent insights into the virus’s complex life cycle have offered new drug targets, and the advent of remarkable—and extremely profitable—drugs that can cure hepatitis C, caused by an unrelated virus, have raised hopes of a similar victory against HBV. The result was the formation in 2016 of the International Coalition to Eliminate HBV, which includes more than 50 scientists from 21 countries. Although the coalition has “eliminate” in its name, it has a more modest initial goal. HBV’s most insidious feature is a latent form of viral DNA called covalently closed circular DNA (cccDNA), which forms a stealthy minichromosome inside the nucleus of infected cells. Many researchers think HBV infection can’t be completely cured without eliminating this stowaway. But no drugs specifically targeting cccDNA are yet in clinical trials, and for now the coalition is trying to catalyze development of “functional” cures. The idea is to knock back the virus, including its cccDNA form, to levels low enough for the immune system to keep the infection in check, allowing people to stop treatment. Although the HBV vaccine has greatly reduced mother-to-child transmission since it was introduced in 1981, some countries—even wealthy ones such as Canada and several in northern Europe—have been slow to adopt it as a routine childhood immunization because their burden of disease is low. China, which aggressively promotes vaccination, still misses many people in rural areas, says Jake Liang, an HBV researcher at the National Institute of Diabetes and Digestive and Kidney Diseases in Bethesda, Maryland. “They haven’t really reached out to the masses,” he says, even though up to 15% of the population is infected. Often the vaccine is not used as recommended: The latest global figures show 84% of infants received their three shots, but only 39% of babies got the critical first dose within 24 hours of birth. Koo was likely infected at birth or early in life. He was among the minority of those infected early who “resolve” the infection, suppressing the virus so well they have no signs of its existence. Other infected children produce huge amounts of virus for years, but they may suffer no apparent harm. That is one of the disease’s odd features: HBV itself doesn’t kill hepatocytes, the cells that make up the liver. The immune response to the virus does the damage, and many children have relatively tame reactions to it for a few decades, leading to the notion that they “tolerate” the infection. Most people infected as adults, in contrast, appear to resolve the infection. “There’s lots of hand-waving and speculation about why that happens,” says Chisari, although it may reflect adults’ more mature immune systems. But most—if not all—of the people who have resolved the infection still harbor cccDNA, and in Koo’s case the consequences were fatal. The chemotherapy suppressed his immune system, allowing the cccDNA to reawaken and generate a massive viral onslaught. “Every big cancer center has had at least one of these patients, and they learn from it,” says Su Wang, a physician at Saint Barnabas Medical Center in Livingston, New Jersey, who is a friend of the Koo family—and is chronically infected with HBV herself. Wang is on the executive board of the World Hepatitis Alliance, a London-based nonprofit run by people who are living with, or have cleared, hepatitis B or C infections. This year the alliance launched a program to “find the missing millions” unknowingly infected with these viruses, promoting a “massive scale up” in screening and, ultimately, treatment. One pillar of the campaign is to reduce stigma and discrimination: Wang says people who reveal their status sometimes are dumped by partners or booted from medical school and health care jobs. This is a main reason why she recently decided to start speaking publicly about her own infection. Wang only learned her HBV status when she was a university undergraduate. Because she has normal liver enzymes and has consistently maintained low levels of HBsAg and viral DNA, guidelines do not recommend treatment with current HBV drugs. Nor do they recommend treatment for the tolerant group who, despite having high viral loads, have relatively controlled immune responses and no liver damage. But learning about her infection has protected her family. Wang’s husband received the vaccine, as did her four children, who were also infused with hepatitis B immunoglobulin (an antibody preparation against the virus). None is infected. For those who show signs of liver damage, doctors have been offering the same three first-line drugs for the past 2 decades. Two of them, tenofovir (borrowed from HIV treatment) and entecavir, target the production of viral DNA. Both cripple the reverse transcriptase (RT) enzyme that converts what’s known as pregenomic viral RNA—a product of cccDNA—into the DNA of new viruses. The third drug, interferon, is an immune system messenger that by illdefined mechanisms attacks various parts of the viral life cycle and also boosts the immune response against it. Each of these drugs can reduce a person’s viral load to undetectable levels and, in some cases, clear viral antigens from the blood. But none eliminates cccDNA. A year ago, a small study of HBV patients treated with RT inhibitors for 6 years or longer briefly raised hopes. Three successive liver biopsies found the 43 participants had “profoundly” reduced cccDNA levels after treatment, a group led by hepatologist Ching-Lung Lai of the University of Hong Kong in China wrote last year in the Journal of Hepatology. In 21 of them, even the most sensitive tests could not find cccDNA. Yet a follow-up study presented at a liver meeting later in the year found that in 13 of the fully suppressed people who went off their drugs, the virus rebounded within 6 months in all but one of them, leading them to restart treatment. There’s growing hope for a more permanent victory. The Hepatitis B Foundation, a nonprofit based in Doylestown, Pennsylvania, tracks the drug development pipeline; it tallies more than 30 drugs now in human trials—a tripling over the past 10 years. “Hepatitis C was consuming all the hepatitis drug space, and with that cure, we’ve seen a stampede of interest in hepatitis B,” says Timothy Block, a microbiologist who started the foundation after his wife, a nurse, learned she was infected (and promptly lost her job). The potential treatments move beyond RT inhibition. Almost every known step in HBV’s life cycle, from infection to the assembly of new viral particles, is a target for at least one new drug. Others are immune modulators designed to turn up specific beneficial responses or dampen harmful ones. Many researchers suspect that, as with HIV, combining treatments that attack the virus from different angles ultimately has the best chance of success. Currently, the firm’s lead experimental HBV drug turns on toll-like receptor 8, a protein on certain immune cells that reacts to viral genetic material by boosting production of interferon and other chemical messengers that crank up natural defenses against the virus. As Gilead reported last year at a liver conference, the drug worked well in woodchucks, driving cccDNA down to undetectable levels, and now is in phase II clinical trials. “This may be the next drug that will be licensed for HBV,” says Stephan Menne, an immunologist at Georgetown University Medical Center in Washington, D.C., who contributed to the woodchuck study. Other drug developers are pinning their hopes on short interfering RNAs, meant to block the production of RNA from cccDNA, and on compounds designed to inhibit formation of the capsid protein that protects the virus’s genetic cargo. “Lots of pharmaceutical companies are throwing everything against the wall to see what sticks,” says Liang, a coalition board member. Chisari worries that immune modulators, a popular strategy, could backfire. If a person has a high percentage of HBV-infected hepatocytes, bolstering the immune response to infected cells could lead to liver failure. “There are a lot of false starts underway, and some might inadvertently do harm,” Chisari warns. Like Chisari, the International Coalition to Eliminate HBV contends that more effort needs to go into targeting the belly of the beast, cccDNA. In September, Gilead signed a $445 million deal with Precision BioSciences of Durham, North Carolina, to codevelop what are known as homing endonucleases—DNA cutting enzymes—designed to snip cccDNA. Gilead scientists have also helped clarify how a particular HBV protein known as X turns on cccDNA to produce more virus, providing a new drug target. “We’re in early days,” McHutchison says. “The field feels like it’s really starting to gain traction and momentum.” Other companies hope to use CRISPR, the genome editor, to cripple cccDNA in patients, as it has done in some test tube experiments. Proving that any treatment significantly depletes cccDNA reservoirs is a tall order. Current clinical trials evaluate how well a drug works by measuring its impact on HBsAg levels and viral load in blood, not on cccDNA. “That is nuts,” Chisari says. “They’re crossing their fingers and using wishful thinking.” Yet monitoring cccDNA directly means subjecting patients to multiple, painful liver biopsies. That could change, if relatively painless and simple fine needle aspirates of the liver can capture enough tissue. Immunologist Mala Maini of University College London has used fine needle aspirates to assess a wide range of immune responses to HBV in the liver, and she’s now collaborating with hepatologist Fabien Zoulim of the University of Lyon in France to see whether the technique can work for cccDNA studies. In contrast to the growing interest in HBV from drug developers, the National Institutes of Health (NIH) spent a mere $44 million on HBV this year—and little of that went to “discovery research,” Block says. “Hepatitis B is completely overlooked and the funding is totally out of proportion to the problem and the need,” he says. Anthony Fauci, who heads NIH’s National Institute of Allergy and Infectious Diseases in Bethesda, agrees and says if the stepped up push for a cure can show some progress, it will drive more funding to research. “All we need is a little bit of success to put more into it,” Fauci says.